Ooh, I think you're going to like my book The Only True God when it comes out (not long now!). One of the points I make is that, while Christianity was solidifying and elaborating certain tendencies in the Jewish "monotheism" of the first century, Rabbinic Judaism was also "shutting down" (as you put it) some of the components of the "monotheism" of that same period. Having read Philip Davies and friends, I am wondering how much monotheism was a development of the Persian/Hellenistic/Hasmonean period(s) and how much was determined by the rabbis in the creation of normative Judaism. Clearly the rabbis deleted traditions of which they disapproved (Enoch, for example) and relegated the priests to the sidelines. But can we really determine the sequence of the trajectory from polytheism to monotheism with any accuracy? Which pieces developed when? Christianity is a flavian myth, based upon a mythical flavian Jesus. If you want the real history then you have to read the NT and the writings attributed to Josephus, between the lines. Discarding the ridiculous, and trying to get some historical order. The development of the Wisdom tradition in the intertestamental period (which is very analogous to the Logos tradition, except Wisdom is conceived in feminine imagery), is certainly not what you would expect from strict monotheism. I disagree with the idea that the impulse to divinize Jesus was an impulse within Judaism. I believe this is an imposition of ideas on ancient Judaism and it also represents ripping the idea of the Messiah out of its Jewish context. I don't deny that ancient Jews practiced magic and the occult arts, and called upon the names of angels. But that is a far cry from making a man into a God. You are missing the Jewish context of all this. The two most important things about the Messiah were 1) the Messiah is just not that important, and 2) the Messiah, like any king, takes second place to the Constitution, the Torah. Nobody is more important than the Constitution. Not even Moses. The Constitution is the guarantee that the Jews will not be subjected to arbitrary rule. Constitutional reasoning is the protection. Even Moses has to acknowledge this, at least in Jewish tradition about Moses. What Jesus' followers did (and Paul played a big role here) was to make the Messiah more important than the Constitution. Is that a Jewish thing to do? I suppose you could argue that this is a possibility in Judaism. But it is one that Pharisees and rabbis staunchly opposed. I suspect Jesus would have too. And going from there to making Jesus divine is another big step. But if you do not see the importance of the Constitution in ancient Jewish culture and how it puts the Messiah in second place, then you are missing a big piece of the picture. A piece that's missing in all this is that the babe must have been named "Immanuel" at birth, and the writer of Matthew knew it. Otherwise, the birth could not have been the fulfillment of Isaiah 7:14, which the writer of Matthew insisted it had been. Yet he had to say his name was "Jesus," because that is what it had been for some decades before he wrote his Gospel. Jews made the same argument, in the 2nd century, which Tertullian lamely tried to answer with the argument that "God is with us," or "was with us," many years before he became equated to YHWH or his son. Therefore your argument that "Jesus" was born as the Angel of YHWH needs to be postponed a few decades until Paul initiated the name change from "Immanuel" to "Jesus." Sorry, I didn't get the argument right. One could say that God, or at least God's wisdom, was "with us" at the birth of Immanuel. But "YHWH saves (us from our sins)" didn't apply, if at all, until after Paul preached the message. Correction - after the inventor of Paul wrote his message. Of course if you look as "Immanuel" as a title rather than a name, the contradiction is not so apparent. What is needed, then, is some context - how often (outside of Isaiah) was "Immanuel" used as a name, or as title, especially around the time of Jesus? I'm not aware that any literature has survived to indicate the name "Immanuel" was used at all in the OT after Isaiah, or even up through the first century CE. I would presume that subsequent to Paul, some writings using the name "Immanuel" did appear, saying that had been his name; however these would have been allowed to wither away untranscribed after the name "Jesus" came to dominate. I am aware of a couple gnostic documents saying that his name had been something other than "Jesus." April, thanks for these posts. I wonder if you might deal with the Son of Man traditions and how you see them intertwining with the Yahweh Angel traditions. 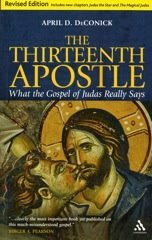 There is nothing in the New Testament indicating that Jesus was, or possessed by, the angel of YHWH. Quite the contrary, the author of Hebres argues against any such thing. I think the angel of YHWH was an actual angel, the one whom YHWH sent to guard or discipline the nation of Israel in Exodus 23.20-23 and 32.34--33.2. This individual is not God himself, as many scholars claim, but someone other than God as these texts make clear. Daniel clearly further identifies this guardian angel of Israel as Michael the archangel in Daniel 10.21 and 12.1. See more about this in my new book, The Restitution of Jesus, now available only at my website at servetustheevangelical.com.